The order books for the new FIAT 500X “Opening Edition” are now open! Only 500 examples of the new special series will be available in the UK, offering customers the chance to not only be one of the first to own FIAT’s stylish new crossover, but also to benefit from a host of additional equipment at zero extra cost. 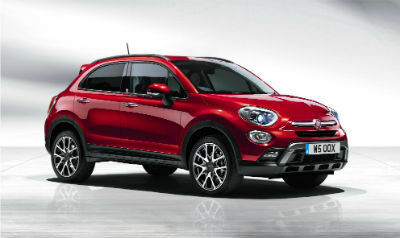 Both flavours of the FIAT 500X are available: 325 examples of the elegant 4X2 “City Look” version and 175 examples of the rugged AWD “Off-Road Look” model will be offered in total. The 4X2 version is based on the Pop Star trim level, which usually comes equipped with 17-inch alloy wheels; body-coloured bumpers; cruise control; front fog lights with cornering illumination; automatic climate control; rear parking sensors; “Drive Mood” selector and the five-inch Uconnect infotainment system with Bluetooth as standard. However, in Opening Edition guise it is enhanced with special “Art Grey” pastel paint; 18-inch alloy wheels; the Safety Pack (Lane Assist; Blind Spot Assist; ParkView reversing camera and "Brake Control" collision mitigation system); the Comfort Pack (Keyless Entry & Keyless Go; front armrest and electric lumbar adjustment on the front seats); tinted rear windows and an “Opening Edition” badge – all as standard. Powered by the 1.4 MultiAir II 140hp, the FIAT 500X 4X2 Opening Edition is priced from £17,595 – the same price as the equivalent Pop Star – but with a substantial £1,725 worth of extra equipment at no extra cost. The AWD version is powered by the 2.0 MultiJet II 140hp engine with a 9-speed automatic transmission as standard, and is available only in tri-coat “Amore Red”. Like the 4X2 version, it includes a long list of extra equipment including a black leather interior with red inserts; Visibility Pack (rain and light sensors, power folding door mirrors, electro-chromic rear view mirror), steering wheel paddle shifters and, again, an Opening Edition badge. This is in addition to the HID headlamps; adjustable cargo floor; front floor mats; 18-inch alloy wheels; 3.5-inch TFT colour display and 6.5-inch Uconnect infotainment system with 3D satellite navigation which are already standard on the top-of-the-range Cross Plus model. Priced from £25,845, the range-topping FIAT 500X Cross Plus Opening Edition offers an impressive £2,850 worth of additional features at no cost to the customer. The FIAT 500X Opening Edition is available to order now in participating FIAT dealerships with first models expected to be delivered in May 2015.